We’d love your help. 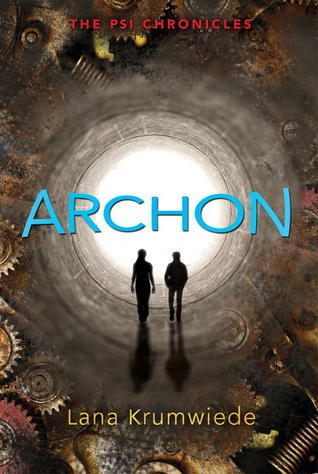 Let us know what’s wrong with this preview of Archon by Lana Krumwiede. As the powerless and the powerful clash, allies and enemies are not always who they seem to be in this dynamic sequel to the dystopian novel Freakling. Having used his unique connection with the Heart of the Earth to terminate the use of psi, or telekinesis, in the secluded city of Deliverance, twelve-year-old Taemon bears the burden of responsibility for the fate of its pe As the powerless and the powerful clash, allies and enemies are not always who they seem to be in this dynamic sequel to the dystopian novel Freakling. To ask other readers questions about Archon, please sign up. Where can I find ratings of this book? First of all, it had the same enjoyable aspects as it predecessor. I still loved "psi" itself, and the interesting setting. Taemon felt a little more confident in this book, which could be very intricate character development, or it could be a lack of character consistancy. I'm deciding that it it the character developing more. Amma seemed a little less confident and less adventurous that before. It's as if Taemon and Amma had switched roles. Gevri was a nice, new touch to the series, and I felt that he really had his own personality. His jaguar (or whatever type of cat it was), Jix, was also a refreshing character. I thought it was so creative and intriguing that animals could use psi as humans do. In the first book, I felt that the author really gave a natural setting. This one is the same quality, but this time has a brand new place– the Republik. I felt that was captured well. Overall, it was another great book. But I'm not giving it five stars, not even four, because there's something dwindling that I just can't explain. I feel that the Psi World needs a little more boundaries. New forms of psi are being introduced here, and there, making it more complex. I think the author might be using that as an advantage. Like when something bad is happened she could just go, "But psi can also do this!" and problem solved. I was captivated by all of the different forms of psi, but when is enough enough? I think she should designate all the forms, make it set it stone. So, as I've mentioned before, I got this book through Goodreads giveaways. Thanks Candlewick. Archon was surprisingly engaging, considering it was for 10 year olds. It's not YA, but more for the middle school audience. I finished it really quickly (around 2 hours), and I was mesmerized by the world Krumwiede presented. I'm considering reading the next and first one. I loved how Taemon and Amma were headstrong and moralistic. They had a strong sense of right and wrong and relied on eac FINISHED!!! I loved how Taemon and Amma were headstrong and moralistic. They had a strong sense of right and wrong and relied on each other. The had an enormous task set out in front of them, and they didn't waver in reaching their goal. I felt that the plot made perfect sense. There was one twist with Taemon's father, but I felt that everything else flowed in the natural order of things. It might have been predictable, but anything else would feel odd. It's 4 stars because it was good, but not "OMG IT WAS AWESOME READ IT READ IT READ IT." It didn't blow me away. And I'm not going to re-read it over and over. Archon by Lana Krumwiede was amazingly well done. I could not put the book down - I could not wait to read the next sentence to find out what will happen. The story of Taeman continues as he embarks on new journeys and make new discoveries. Along the way, he will find new friends and foes alike. He will discover what responsibility truly means and how important family is. I loved this book and I highly recommend it to all age levels. I love when good sci-fi takes an unexpected turn . . . and remains good sci-fi. I cannot wait to find out what's in store for the True Son in book three! Love how this author created an amazing new universe to complement this sequel. Anyway, this series allows me to reflect a little bit on what it means to write a review and to review a book, because I'm torn here between my role as an adult reader and my role as a teacher of reading to seventh graders. - While I find that the concept of psi (psychokinetic abilities) really neat and its existence is woven well into the story, I also am finding that the psi is baked into pre-ordained plot points instead of a thoroughly understood concept. For example, the magic and mysteries of psi are only revealed when it is convenient for advancing the plot forward, and large problems are resolved with simple "fixes." But as a teacher of reading, my rating goes way up. - I think readers will latch onto a born hero who makes decisions he regrets and outright mistakes. We appreciate that he isn't perfect. - The plot moves swiftly and economically. There are some subtleties that students will probably miss or find confusing (there's a side-side plot about a war with another nation, for example) but for students looking for an adventure/rescue story they'll enjoy their reading journey. - I love books that are middle grades without *feeling* middle gradesy. 13 year old boys (and girls) aren't necessarily experienced enough readers to attempt half the books they think they can read, but they also don't like the idea that they are being sold the "light" version of a book they might want to read. The Psi Chronicles is ideal for that upper middle grades market that isn't ready for a true YA but thinks that they are. I look forward to booktalking this series in my classroom! So my 4 star review reflects my dual role as an reader and as a teacher of seventh graders. This second book in the Psi Chronicles trilogy begins with Taemon and Amma going to the Republik to look for his da. They befriend a young Republikite named Gevri who helps them get into the military outpost on the other side of the mountain. There, Taemon trains a group of seven very young Archons, psi or dominion-wielding warriors. At the same time, Taemon is looking for his father in the dungeons. The archons help him and they escape, but the Republik army pursues them across the mountains an This second book in the Psi Chronicles trilogy begins with Taemon and Amma going to the Republik to look for his da. They befriend a young Republikite named Gevri who helps them get into the military outpost on the other side of the mountain. There, Taemon trains a group of seven very young Archons, psi or dominion-wielding warriors. At the same time, Taemon is looking for his father in the dungeons. The archons help him and they escape, but the Republik army pursues them across the mountains and Gevri feels betrayed. I received this as part of the Goodreads Giveaways. So the copy I read was an ARC, which means some parts may be different from the retail copy. I will try to be as spoiler free as possible. I also apologize if my writing is not great.As this is a YA novel I did not expect it to be at an adult level, and this book works very well for that level. This book was a really great read, in fact I finished too quickly. It had me on the edge just waiting to see what would happen next, and upset when it was I received this as part of the Goodreads Giveaways. So the copy I read was an ARC, which means some parts may be different from the retail copy. This book was a really great read, in fact I finished too quickly. It had me on the edge just waiting to see what would happen next, and upset when it was over because I wanted more. I absolutely love these characters, Taemon and Amma play well off each other. You feel for them, and genuinely want them to succeed. Each bump in the road no matter how insignificant, worries you. The fact that these characters have not yet developed romantic atttractions (or has not been mentioned), is another plus for this novel. I have no issues with that type of scenario, but it needs to follow a logical path. If the characters eventually became romantically involved, it would feel natural. The plot does have a few issues here and there. Part of how it ends is a bit predictable, and seemed out of character for the person. Even though it is a new character, it just didn't seem right. Which is why it didn't receive higher marks from me. Archon is the continuation of the Psi Chronicles that started in Freakling. Taemon has successfully gotten rid of psi in Deliverance and the community has fallen into chaos as people try to figure out how to live without psi and do things manually. Taemon learns that when he asked the Heart of the Earth to get rid of psi it left everyone except him. So not only did he destroy everything he kept power for himself. Taemon also discovers that his father has been taken over the mountain into the Rep Archon is the continuation of the Psi Chronicles that started in Freakling. Taemon has successfully gotten rid of psi in Deliverance and the community has fallen into chaos as people try to figure out how to live without psi and do things manually. Taemon learns that when he asked the Heart of the Earth to get rid of psi it left everyone except him. So not only did he destroy everything he kept power for himself. Taemon also discovers that his father has been taken over the mountain into the Republik. Taemon and Amma venture over the mountain and discover the Republik is building up an army of psi warriors to invade Deliverance. Taemon's action hasten the invasion and he has to bring all the communities of Deliverance together to fight back the Republik. First of all, I don't recommend anyone reading this book. In fact, I do not know why I finished this book at the first place. Whoever enjoyed the first book of this trilogy, this book is not the same. The story is boring and very long for no reason, some characters are unnecessary, and most importantly, it wasn't fun. No events in this book got me excited or want me to flip to the next page. Also, there wasn't any story structure, and if it did, it was hard for me to catch it because it wasn't d First of all, I don't recommend anyone reading this book. In fact, I do not know why I finished this book at the first place. Whoever enjoyed the first book of this trilogy, this book is not the same. The story is boring and very long for no reason, some characters are unnecessary, and most importantly, it wasn't fun. No events in this book got me excited or want me to flip to the next page. Also, there wasn't any story structure, and if it did, it was hard for me to catch it because it wasn't described well. Rarely are second books of a series this great! Amma and Taemon are constantly traveling to help their communities now that Taemon has asked the Heart of the Earth to remove all Psi power from the people. The people in the city Deliverance have never used their hands before so the people of the farm community are trying to help them adjust. This is when Taemon hears that his dad is on the other side of the mountain which is the military community, the Republik. He and Amma cross over to the Repub Rarely are second books of a series this great! I really liked the first book in this series and gave it 3.75 stars, so I was looking forward to the second one. However, I have to say I was disappointed. I felt kind of rushed through the story, and it seemed to me that the author was doing all the "telling," rather than letting the characters do that through dialogue. I'm giving this 3 stars because I just can't bear to give it less when the first volume was so promising. But my disappointment made this feel like something in the 2.5-2.75 star I really liked the first book in this series and gave it 3.75 stars, so I was looking forward to the second one. However, I have to say I was disappointed. I felt kind of rushed through the story, and it seemed to me that the author was doing all the "telling," rather than letting the characters do that through dialogue. When I picked this up I was full of excitement. What happened to Taemon and Amma and the rest of their land as psi disappeared? My expectations for this book were great, it turned out to be phenomenal. The plot twists scattered throughout the perfectly written pages caused me to become absorbed into the emotional, action packed sequel to the first book in the series, Freakling. This is one of the best books I've read in a while and is perfect for kids (and adults) of all ages. Great job Lana! A great continuation of the first book in the trilogy, providing a nice bridge for a final showdown in book 3. I.didn't enjoy the world quite as much, but that's probably because the world and characters were in turmoil. Still, it would have been nice if a bit more of the Republik and wider world had been fleshed out besides the Outpost. Still not totally sure I understand the big war at play in the background. Overall, a captivating read. Looking forward to book 3. Book 2 of THE PSI CHRONICLES by Lana Krumwiede finds Deliverance in the midst of crisis. The city dwellers are unwilling to adapt to life without psi. Society is in disarray. Taemon is intent on finding his mother and father and searches the city asylums desperately looking for them. When Taemon's psi returns he determines to travel over the mountains to the Republik hoping to rescue his father. His actions bring his world to the brink of catastrophe. You must read the first book to understand this book. That being said following Taemon and Amma over the mountain and to the Republik was a good read. I was quite frustrated with Taemon as I felt like he was just being stupid much of the time. Gevri is a great addition to the series and I can't wait to see what happens next. I will not be putting any spoilers in this review. I was lucky enough to win an advanced copy of this book. While the book is short, or at least seemed to be, a lot happens and even if you haven't read the first book, you get a general idea of what happened in the previous book. I would definitely recommend this book. Especially for middle school aged childen. Love this series, and though it was a little intense sometimes, i love how it ended. I thought the direction everything went was a very natural progression of things, after what happened in the first book and i can't wait to read the last in the series. I hope Lana Krumwiede will keep the stories coming. I didn't like this book nearly as well as the first in the trilogy. A lot of second books in a series share the problem that this one has. I felt that there was way too much waiting and setting up the story without much really happening. It just felt like filler. And once there was finally some action it was resolved too quickly and easily. I was a big fan of Freakling which won the 2013 IRA Honor Award for intermediate fiction. Part of the Psi Chronicles, it's a dystophia series appropriate for intermediate readers. Archon picks up where Freakling leaves off. I loved this book more than the first! I grew attached to the characters, loved the sweet little archons (what will happen to them?!) and am a little grumpy I have to wait until the next book to read what happens! Archon from the Psi Chronicles was a great read except for one thing. In my opinion, the story felt a little rushed and short for my standard. That is my only critique. I recommend for all ages. Curse of the 2nd in the series. Not as good as the first one, and I had one issue with the main character's progression, but still an enjoyable read and I look forward to the next. Pretty good. I finished the last book though so i don't have a review for it. i'll just say that i recomend the series because it's pretty good. In third grade, Lana wrote in her autobiography that she wanted to be a mother, a writer, and the church organist. Two out of three ain't bad! Her work has appeared in Highlights, High Five, Spider, Babybug, The Friend, and Chicken Soup for the Child's Soul. Freakling is her first novel. Lana has tried psi many times, particularly when it comes to household chores, but she could never make it work In third grade, Lana wrote in her autobiography that she wanted to be a mother, a writer, and the church organist. Two out of three ain't bad! Her work has appeared in Highlights, High Five, Spider, Babybug, The Friend, and Chicken Soup for the Child's Soul. Freakling is her first novel. Lana has tried psi many times, particularly when it comes to household chores, but she could never make it work. She does have a few mildly supernatural abilities, which include untying knots, peeling oranges, and winning at board games. Her perfect day would include reading, writing, swimming, cooking, telling jokes, spending time with family, and pie.